As in Nova Scotia, the weather in the province of New Brunswick kept us guessing. Approaching Halifax, Nova Scotia we were caught in torrential rains and the same thing happened as we approached St. John, New Brunswick’s capital. Nature’s fury was followed by periods of bright sunshine, then another round would arrive. We happened to read the Canadian news on Sunday, only to learn that a tornado touched down in the northern province of Newfoundland of all places. Such an event is virtually unheard of. Otherwise New Brunswick looked a lot like Nova Scotia, at least its eastern parts as we wended our way south to St. John: gently rolling hills with mixtures of coniferous and deciduous trees with many picturesque lakes to enjoy. New Brunswick must have a sizeable French community because sign were typically in both English and French, not too surprising as it sits east of the French province of Quebec. 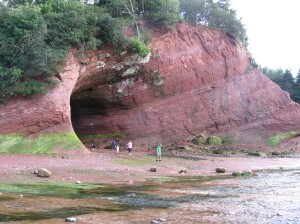 Fundy Bay sits between New Brunswick and Nova Scotia. It’s likely its shape which gives it extraordinary tides. We saw these for ourselves when we ventured off the major road to a back road, that took us into the city of St. Martin. It sits about thirty miles north of St. John. 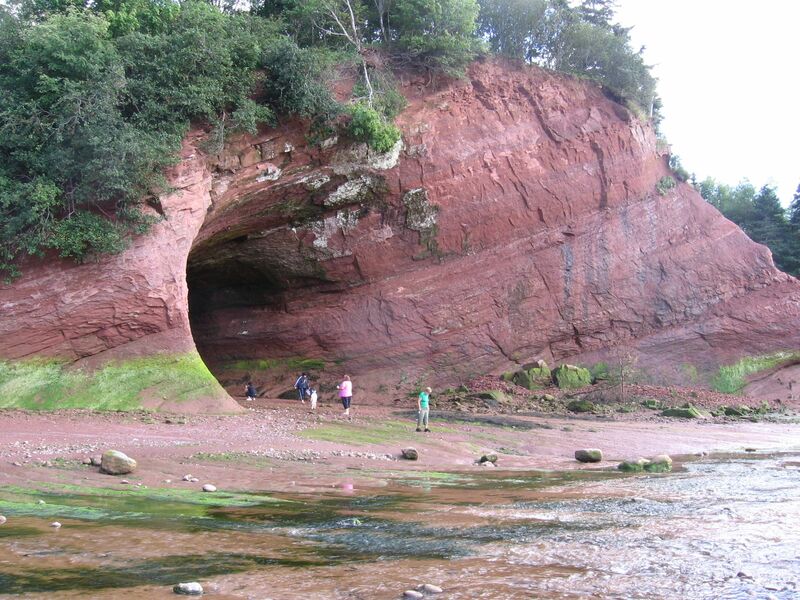 Aside from the variety of small businesses mostly oriented around the tourist trade, its principal attraction is the Fundy Trail, where the effects of tidal forces are quite spectacular. There we found a tidal beach at low tide. Tourists walked over the rocks into enormously tall caves in the cliffs. Six hours later these cliffs would mostly filled with water and be accessible only by adventurous kayakers. Tides along Fundy Bay can be up to forty feet. We also found a lighthouse on a back road that was approachable. The coasts of New Brunswick are quite spectacular for the many dramatic cliffs and the effects of tides on these surfaces. There water and coastline meet in spectacular and timeless drama. The capital city of St. John proved itself as interesting and ethnically diverse as Halifax, just somewhat smaller. One impressive feature of the city is its hills, not so much for their height as for their steepness. Having seen the hills of cities like Seattle, Tacoma and San Francisco, St. John was at least a peer. Otherwise St. John was mostly a place to spend a night before venturing back into the United States through Maine. We wished we had scheduled more time for a proper visit. We reentered the United States through the border crossing at St. Stephen then drove west passing through Bangor before arriving at Waterville, to spend some hours with friends. Our final destination for the night was Ellsworth along the southeast coast, something of a gateway city to Bar Harbor and the Acadia National Park. We did our best to endure a musty smelling but otherwise clean room at the local Ramada Inn. This is our third trip to Maine, but our first to this premier national park. It’s hard to get to, but it is a treasure once you arrive. Arguably the park has more diversity than any other national park, not in its citizenry, but in the variety of geological and natural formations at the park in what is a fairly small space. It’s unique in other ways too. Land for the park was largely ceded by landowners to the federal government, principally to ensure that its natural treasures would always be available. This leaves half of the island still in private hands, including the city of Bar Harbor, and lots of townships on the island with all sorts of small businesses, hotels and B&Bs for tourists to enjoy. Mostly the island is a natural wonderland. We did our best to see everything, but there was no way to do it in one day. Cadillac Mountain, its highest point, provided a full vista of the island. It is one of eleven mountains on this island, and the mountain’s 1500 feet turns out to be the highest mountain on the east coast. 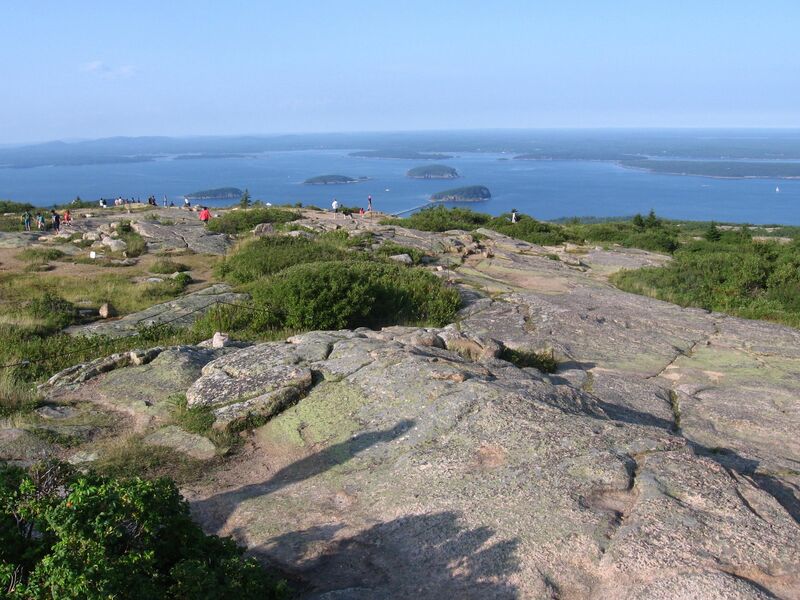 The view at 1500 feet though is spectacular, with the mainland, the Atlantic, Bar Harbor and other nearby islands easily visible. We were fortunate to tour the island on a picture perfect day, with temperatures in the low 70s. Every few miles down the road brought a new spectacular wonder: a rare sandy beach on the Maine coast, a thunderhole driven by the relentless sea on rocks, picturesque marshes, a clear lake with its own sandy beach, multiple picturesque marinas, and a natural seawall. We saw perhaps thirty percent of the prominent features on the island, and wished we had scheduled a couple of extra days to see the rest. Our vacation though is wending toward its end. Only one destination remains before returning home: Cape Cod. A report is forthcoming.